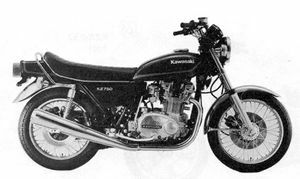 The Kawasaki KZ750B is a motorcycle produced by Kawasaki from 1976 to 1982. 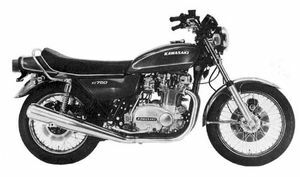 Remarks: Four-stroke, vertical twin model. 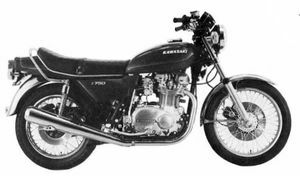 Has disc brake on both front and rear, and Mikuni BS-38 constant velocity carbs. Engine has dynamic balancers and dual-camshaft. Fuel Level: 31 +/- 1mm from center of carburetor's bore. Major Changes: Color and marking. Starter lockout switch added. Audible turn signals added except for US and Canadian models. Major Changes: Color, marking, front brake master cylinder, front brake caliper position, and generator. Spark plugs changed to NGK B6ES or ND W20ESU. Needle beatings are used in swing arm. 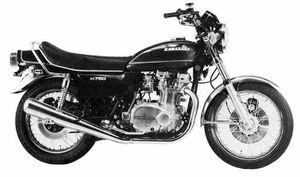 Remarks: 4-stroke, vertical twin model. Front & rear disc brakes, CV type carburetor.